Sorry, there was an error connecting you to the application. Contact your administrator and refer them to the setup instructions here. They should ensure all credentials (key/secret/url) are entered correctly in the app setting. The learner likely did not click Submit Assignment at the end of the bulb. Ask the learner to go back to the completed bulb and click the Submit Assignment button. They will not need to re-do the assignment. See The Student Experience for more information. The learner completed the bulb outside of Blackboard. Ask the learner to go back, launch the bulb link from your Blackboard course and click the Submit Assignment button. Learner is not connected to this course in the Learning Management System (LMS). Go to your student roster within Blackboard and add the student to your course. Then have the learner launch the bulb from the Blackboard course and click the Submit Assignment button. Learner accessed bulb outside of the Learning Management System (LMS). Unable to export. Learning Management System (LMS) did not provide export url. Check configuration settings. Grading was not enabled by the instructor for this bulb link. To enable auto-export into the Blackboard gradebook, make sure you enable grading when setting up the assignment. Check to make sure you are using the correct email address. Press the user icon in the top right hand of your nav page and click on 'Profile' in the dropdown menu. Under the 'Profile' section, you will see the email address you are currently logged in as. If you are in your LMS, make sure to check your profile there as well and ensure you are in the correct LMS account. It is not recommended to edit this bulb since students are in progress. Learners in your course have started taking this bulb. If you add/remove questions or change the answer key for any questions, these edits will not be reflected for learners that have already answered questions. Any edits made to the question text or bulb settings (network bypass, rewind, fast forward, skip, retake) will be updated for learners even if they have already started the bulb. Each bulb can only be assigned once per course. Do you want to copy this bulb and assign? You must make a copy of the bulb to assign it again. The same bulb can only be assigned once in a given course. To reassign, create a copy of the bulb. Note that these will appear as separate assignments in the PlayPosit monitor and the Blackboard grade center (if grading is enabled). Any changes you make to the original bulb after copying will not be reflected on the copied version and vice versa. Bulb link is not set up. Please contact instructor. To auto-export grades from PlayPosit to your LMS gradebook, make sure you enable grading when setting up the bulb link. Learners can continue and take the bulb, data will still appear in the PlayPosit monitor analytics. This bulb was set up to be launched from your Learning Management System (LMS). Please access from your LMS. Ask the learner to navigate to your course from the LMS and launch the bulb link. An email address is needed in order for PlayPosit to authenticate you into your account from Schoology. 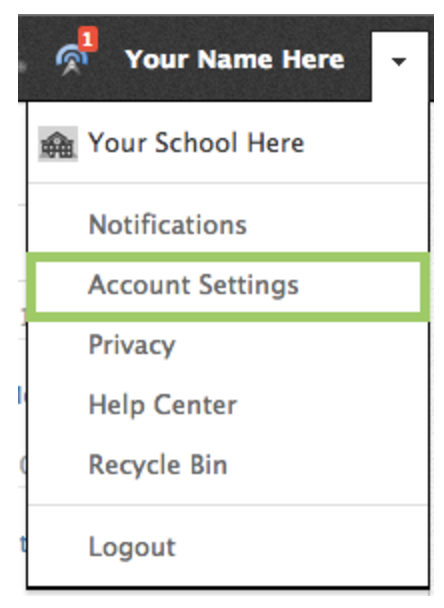 Navigate to your Account Settings within Schoology to add an email address (instructions here).